Jim Puterbaugh was blessed with grandparents and parents who were faithful, active, and dedicated Christians. Born in 1940 to a family that was part of the church of Christ in Ohio, he spent his early years in Bellbrook, a small town close to Dayton. In 1953 they moved to St. Petersburg, Florida where their home became a regular meeting place for many young Christians from the area. Jim's two brothers and two sisters were also fine Christians, so he grew up in an unusually healthy spiritual environment. Graduating from high school in 1958, Jim enrolled at Florida College for 3 years of Bible studies under Homer Hailey, Clinton Hamilton, Harry Payne, Jim Cope and Bob Owen. He continued his education by getting a Bachelor of Arts degree in Religious Studies from the University of South Florida. Further Biblical and language studies were conducted at a Christian Church college in Seattle, Regent College in Vancouver, British Columbia, and New College, Berkeley, California. 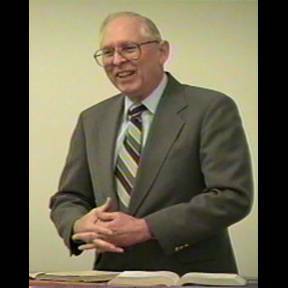 Jim began working with local congregations in 1963, preaching in northern California, Alaska, and Washington. After teaching at Kirkland and Lake Hills, Washington in the 70's, he decided to get involved in the Philippines. His first trip there was in 1977, and for several years, he made trips to the Philippines for the express purpose of studying with Filipino preachers. In 1990 Jim moved to the islands permanently and in 1991 adopted 5 Filipino orphans, four boys and one girl. The children were from the northern province of Quirino, so the family lived there for the first 8 years and then in 1998, they moved to Metro Manila. Presently, the children are grown and are all active students in college. The oldest son, Philip, finished his training and received a Medical Doctor's License in 2004. Lyn, the daughter, Larry, her husband, and Jephy, their 4 year old son, live with Jim and his sons. All of the children are faithful members of the family of God. They are a great joy and encouragement to Jim, and the Filipino preachers tell him his sermons and classes are much more relevant to their needs as a result of his having raised these children and lived full time in the Philippine culture for these last 15 years. Jim has supported many other young Christians through their college education and like his parents before him, Jim's house has been a second home for many Filipino youth. Jim works with the "Taft Avenue" congregation in Pasay City, Manila. This congregation has an attendance of 70, more than half of whom are college age. In addition, he normally conducts two seminars per month (3 to 4 days each) for the Filipino preachers throughout the various islands of the Philippines. The primary goal of Jim's work in the Philippines has been to help the preachers of this nation to live a sincere Christian life style and to train members of their congregations to do the same. This is a great challenge due to the terribly corrupt culture that controls their society. Through the years, many preachers have traveled from the States to assist Jim in these efforts including Don Wilson, Wallace Little, Jerry Bassett, Lowell Williams, Mike Mendez, Dan Melear, Carl Main, Larry Haverstock, and Jim's brother Ben. These men have lived in his home, met his children, and worked along side him in these preacher training seminars. They can vouch for his commitment to Christ and the Gospel as well as his personal life and work. Jim feels quite blessed to have Christian brothers and sisters in the USA who are supporting his work and life. He often expresses a deep and abiding appreciation for the many saints who have funded his work for so many years.